Garage doors are a nice modern convenience, but if you don’t protect and maintain them, they can be damaged by regular use and inclement weather. If you want to protect your home, you need a garage door that can stand up to the wind. In this post, we’ll give some good advice for reinforcing your garage door, and preparing for inclement weather to make sure your property stays safe. Building codes account for local weather, so if you live somewhere very windy, you’re probably required to use a wind-reinforced garage door on new construction. If your current garage door isn’t windproof, there are two easy solutions to reinforce it against the wind. The first solution is to install stronger steel struts to your existing garage door. You don’t necessarily have to know what a strut is—just know that they reinforce your door so that when it’s down, it stays in place. In weatherproof garage doors, those struts are larger and more reinforced. Garage door struts are a pretty specialized product, so you may not be able to find them at your local store, though it is quite likely that your local garage door contractor in Nampa, ID will have them on hand. The second solution is to add a vinyl seal to your garage door. This will help your door keep an airtight seal when closed. What damages a garage door in high winds is often the enormous shifts of pressure felt inside the home when high winds pick up. Keeping your garage properly sealed makes it safer. Clear your lawn of debris: One of the most common causes of home damage in high winds is from outdoor debris being thrown around. When the weather calls for high winds, clear your lawn of anything that could be picked up and hurled at your home at 60 miles an hour. Trim back dangerous-looking tree limbs: In the same vein, trim back tree limbs hanging over or close to your home. The risk associated with not doing so is considerable. Make sure your roof and gutters are safe: Having the latest high-end garage door isn’t much use if the roof above it collapses from wind or water damage. Regularly keeping track of the status of your roof and gutters is a basic responsibility of homeownership. Weatherproof the rest of the home: Pressure and ventilation play an enormous role in how homes are damaged in high winds. In addition to adding that vinyl seal to your garage door, weatherproof the rest of your home. When the storm hits, you’ll be all battened down. If you’re looking for a garage door contractor in Nampa, ID to reinforce your garage door or install a new up-to-code garage door, give Haney Door Service a call. 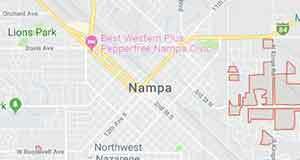 We’re a family owned and operated business that has been serving the Nampa area for over 30 years. If you want to work with honest, hardworking people who truly value your business, reach out to us today!